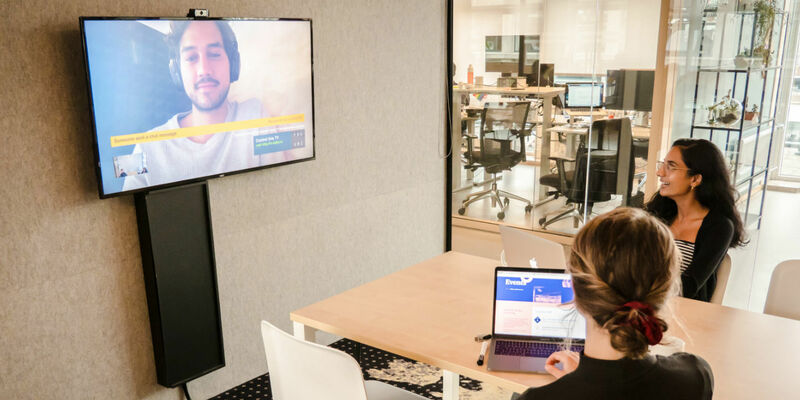 Together with Daily.co, we help startups succeed at remote work, with 1-click video calls and wireless presentations, across our conference rooms, computers, and phones. Daily.co is a facilities partner. Together with Daily.co we're trying to make remote work easier, powerful, and multi-screen. Daily.co is 1-click video calls & wireless presentation, in a complete system - on big screen TVs in TQ’s conference rooms, as well as any computer and phone. Daily.co is new video calling built for startups and SMBs. Launched after participating in Y Combinator in 2016, Daily.co is a distributed team itself, with its HQ in San Francisco. Their goal is to make video calls a more natural experience - easier and powerful, and cleanly designed. Daily.co combines ease and power. Residents can create unlimited rooms on their custom subdomain. Every meeting supports 50 guests, dual screen sharing, recording from a computer, and free dial-in in the Netherlands and 25+ countries. There are no time limits, no seat fees, no downloads, so startups can easily scale. Our conference rooms are equipped with big screen video calls and wireless presentations, with Daily.co TV hardware. Instead of crowding around a laptop, a group can sit at a TV and quickly start a meeting. No need to bring or plug into cables. You don’t have to be in front of a TV to use Daily.co. Its free software means residents can send a meeting link to anyone, and also use the software on any computer or phone. It’s a flexible system, working wherever you, your team, and your customers are.